You're unlikely to find a phenomenon like Carmine and Vinny Appice a second time in the history of rock music. For more than forty years, the two brothers have been among the most sought-after and renowned rock drummers worldwide. Carmine and Vinny (each of them on their own) can be heard on numerous legendary albums and have toured countless times with some of the world's greatest acts. Carmine embarked on his musical path in the 1960s with the unforgotten VANILLA FUDGE, manning in the course of his illustrious career the drums for superstars such as ROD STEWART and OZZY OSBOURNE, among others. His brother Vinny, who is eleven years his junior, looks back on an equally spectacular career, having worked with acts such as BLACK SABBATH, HEAVEN & HELL and DIO, among others. With the exception of the live album Drum Wars - Live! (2014), there has been no direct collaboration between the two so far. That's about to change! Sinister is the first joint studio album by Carmine and Vinny and was recorded with the support of a number of prestigious guests. Vinny: "As Ringo said: with a little help from our friends." Sinister consists of a total of 13 tracks, recorded by Carmine and Vinny together with distinguished colleagues. "Killing Floor" and "Future Past" feature the wonderful Craig Goldy (together with bassist Tony Franklin), Franklin resurfacing, together with Paul Shortino, on "Suddenly" and on "You Got Me Running". Shortino also lends his awesome vocals to "War Cry" and the programmatic "Monsters And Heroes", the latter also featuring BULLETBOYS guitarist Mick Sweda, while Shortino teams up with WHITESNAKE stringsman Joel Hoekstra on "War Cry". Talking of vocals: "Sinister", "Danger" (bass: Phil Soussan), "In The Night" (guitar: Bumblefoot) and "Sabbath Mash" (guitar: Erik Turner, keyboards: Erik Norlander) are all sung by Jim Crean, while Chas West recorded the vocal parts for "Killing Floor", Scotty Bruce featuring on "Future Past" and Robin McAuley on "Riot". The biggest surprise of all: Carmine himself doubles as vocalist on "You Got Me Running". Vinny: "Carmine has been singing lead and background for years. He´s a very good singer and I´m glad he sang one number on this record." 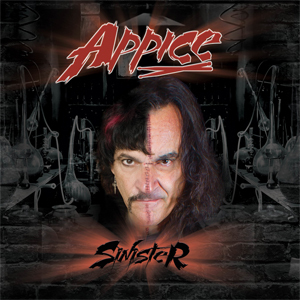 So fans can look forward to a haunting rock album, which the Appice brothers plan to premiere, live on stage as soon as possible. Carmine: "We cannot wait to take the album on the road! Heavy drums and heavy songs. It will kill!" Sinister will be released on October 27th, 2017 through SPV/Steamhammer as CD digipack, double gatefold vinyl, download and stream.